Some films you need to watch again to remember how truly magnificent they are. Raiders of the Lost Ark is one of these, without a doubt. It’s got everything; running, explosions, fighting and humour – oh, the humour. Here’s a recap if you have no idea of what I’m talking about. Indiana Jones (Harrison Ford) is an archaeology professor at a university. But he also obtains hidden ancient treasures. Now, if he was just taking things for the sake of taking them, or for money, that wouldn’t be so ace. But he’s getting them before the Nazis, and so he is a hero. Oh, yes, it’s set pre-WW2. Hitler is about, but the war hasn’t started yet. Indiana Jones needs to get a pendant from the Marion (Karen Allen), daughter of a fellow adventurer. He then needs to get the writing on it deciphered, make a rod, go to a map room in the middle of a dig run by the Nazis, find the location, dig up the ark and escape with it. The only help he has is Marion and his mate Sallah (John Rhys-Davies) and he is against a nasty archaeologist, Belloq (Paul Freeman) and a whole heap of Nazis. The whole thing is action, action, action, with a tiny bit of romance for fun. It’s awesome and fun, and if you haven’t seen it, do. I don’t know anyone who does not like Raiders of the Lost Ark. 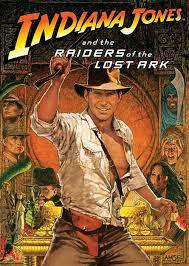 Raiders of the Lost Ark won Oscars for Best Art Direction – Set Decoration, Best Sound, Best Film Editing, Best Effects, Visual Effects and Special Achievement Award (for sound effects editing) and was nominated for Best Picture, Best Director (Steven Spielberg), Best Cinematography and Best Music, Original Score.